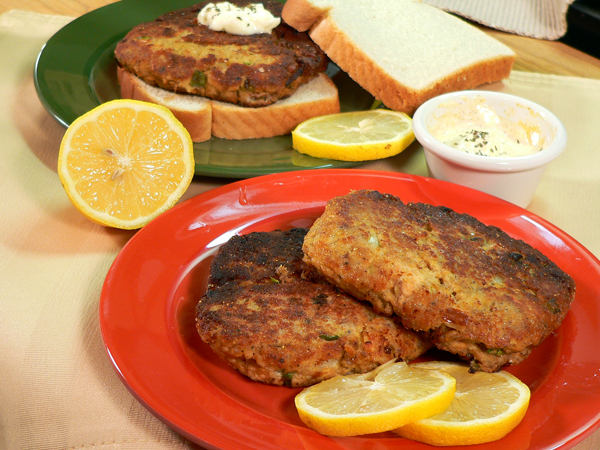 Southern Fried Salmon Patties: This is fish even the kids will enjoy eating. Simple, quick, easy to make and tastes even better between two slices of bread or in a bun. Add a little mayo or whip up your own special sauce and you’ve got supper on the table in no time flat. This recipe originally appeared February 20, 2012……. We didn’t eat Salmon Patties a lot when I was growing up, but I’ve always enjoyed the taste. Of course I like pretty much anything that I can slap between two slices of loaf bread. I’m totally hooked on sandwiches of about any kind, always have been. As an adult, I’ve learned to enjoy salmon in various ways. I like it baked in the oven, fried in a skillet, or my favorite…smoked on a grill. It’s a bit pricey on the fish side of things, but something I enjoy whenever I can. 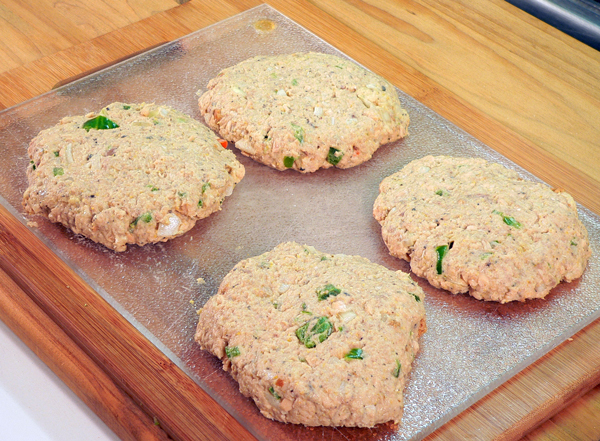 The really nice thing about these Salmon Patties is how simple and quick they are to prepare. 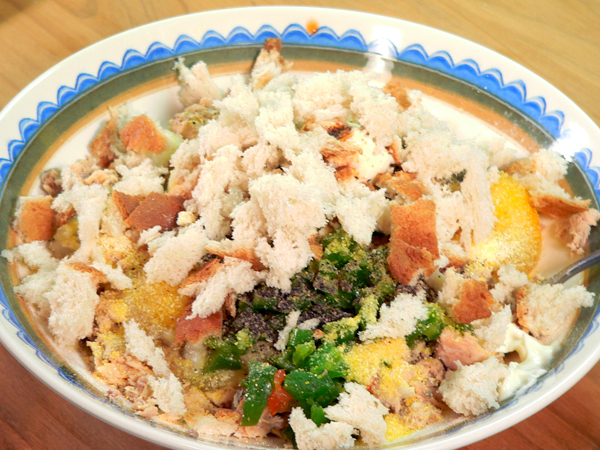 I’m using a canned salmon and ingredients that are pretty much a staple in any kitchen. I try to keep a can or two in the kitchen cabinets all the time. You’re basically just going to mix it all up in one bowl and fry them up in the skillet. 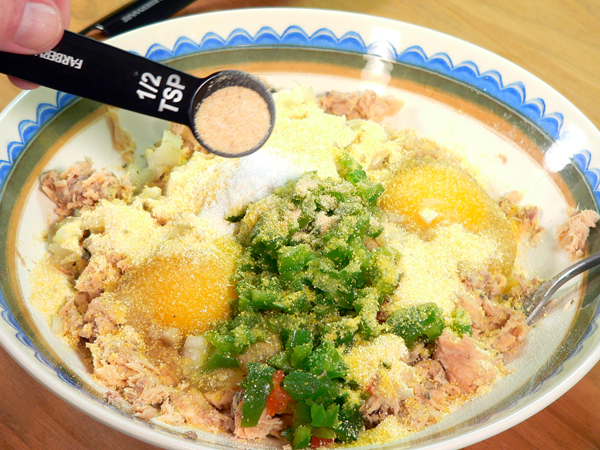 You can prepare the mixture and refrigerate it for several hours before cooking if need be. 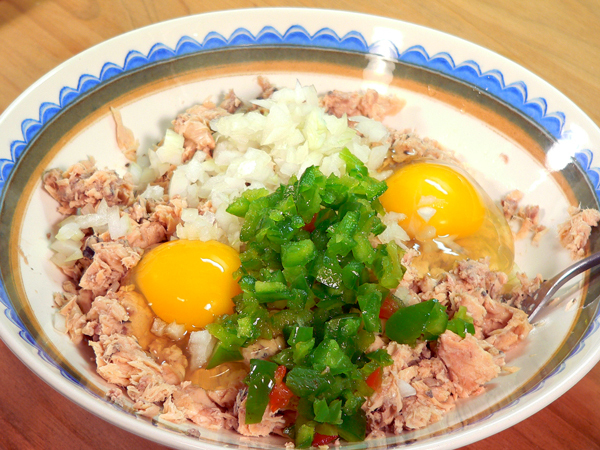 It makes a great main dish meat or a quick and easy sandwich, which ever way you want to go. So, if you’re ready….Let’s Get Cooking! You’ll need these ingredients. It might look like a lot in the picture, but it’s mostly seasonings. 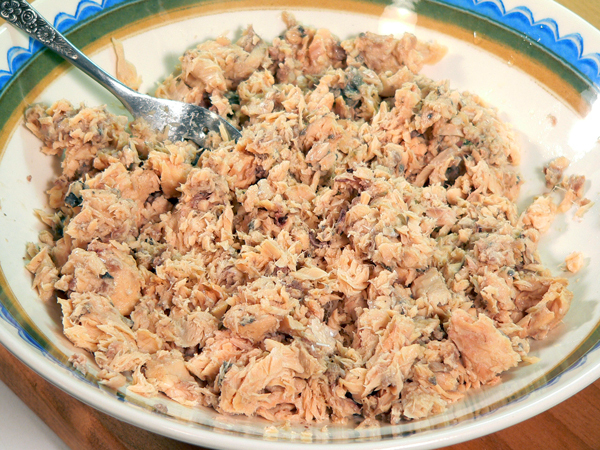 Open up the can of salmon and dump it in a colander in the sink. Let any liquid drain off for a minute or two. If you look closely, you’ll see some bones. They are edible but I like to remove the bigger ones, especially the big round ones from the spine area. It’s just a little crunch that doesn’t sit right in my mouth sometime so I take them out. It’s your option, but again, they are edible so you don’t have to be concerned about them. 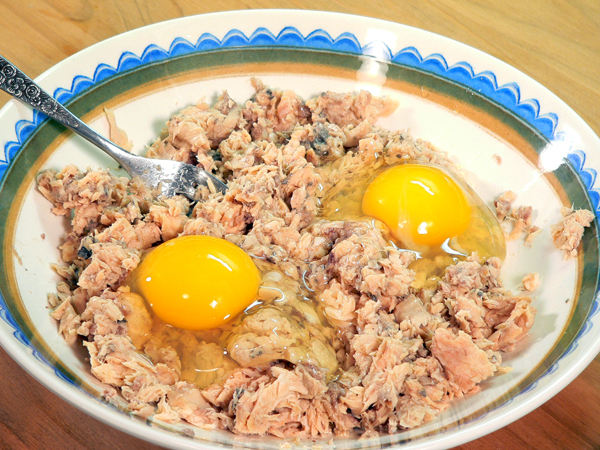 Use your hands or a fork and flake the salmon up into large chunks. 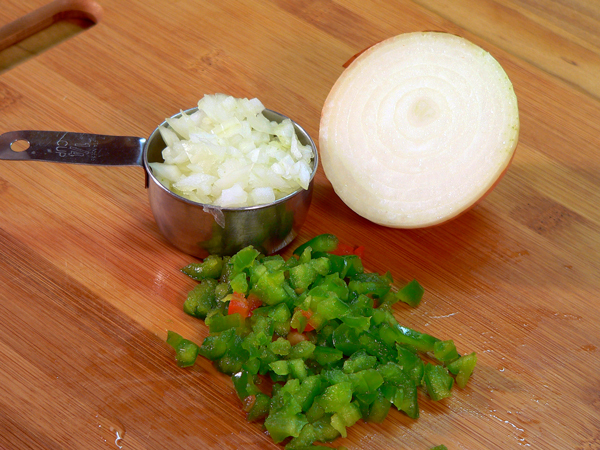 While the salmon is draining, chop up the bell peppers and the onion. 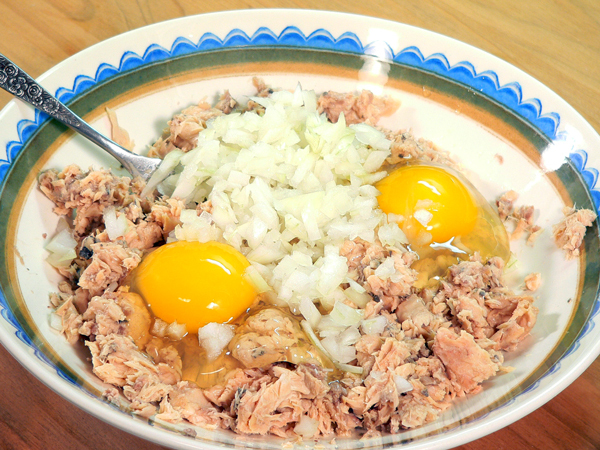 Place the flaked salmon in a large mixing bowl. Add two whole eggs to the bowl. We’ll just dump in all the other ingredients and mix it up at the end. 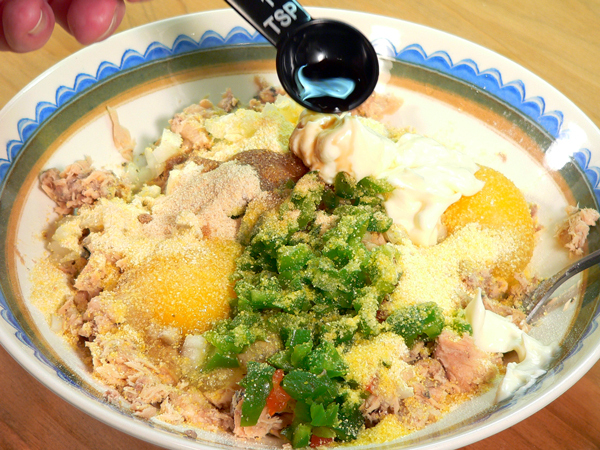 Mixing each ingredient in one at a time will turn the salmon to mush. You want to try and keep some large chunks in the mixture. Add the chopped onion to the bowl. Add the chopped bell pepper. I’ve mentioned this before, but I buy bell peppers during the summer months and chop and freeze them. They just get pretty expensive around here during the winter months. When I can get them 5 for 1.00 during the summer, I buy a few extra, prepare them, then freeze them in plastic bags. I can usually take out what I need for a recipe and let them thaw for a few minutes and that step is done. Of course, I love fresh ingredients whenever they are in season. Add the corn meal. The meal acts as a binder to help hold the ingredients together. Add the mayo. The oil serves as another part of the binder to help hold things together when we shape the patties. Add the Texas Pete Hot Sauce. It’s not really going to add any heat to the patties, just a little flavor. Of course, you can add more if you like. Add the ground black pepper. Break up one slice of regular white loaf bread. You can crumble it up or leave it in large pieces like I did. Bread crumbs will work fine. I don’t recall mama ever using bread crumbs back in her day. She’d just take a slice or two of bread and break it up into the patties. She’d do the same with her meatloaf. Seeing those pieces of bread in the finished product just brings back fond memories for me. The bread is another binder for the mixture. 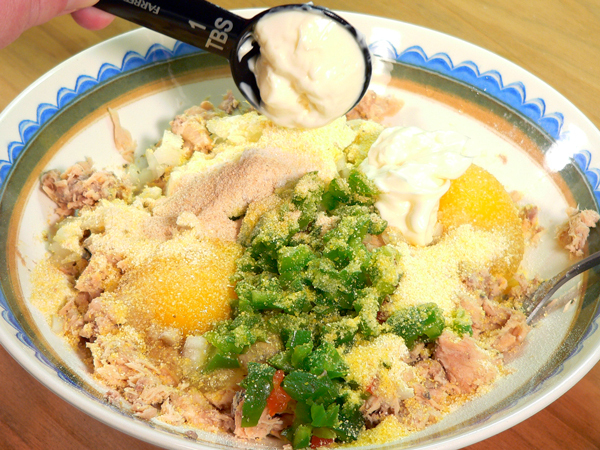 Use a fork or spoon and gently mix all the ingredients together. Don’t over work it, just get it all combined. Add the flour. I usually adjust this amount depending on how moist the mixture is at this point. You don’t want it so dry it doesn’t stick together but then again, you don’t want it all mushy wet either. 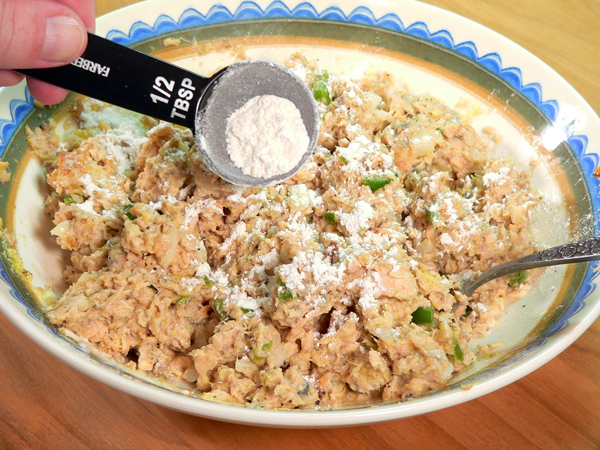 Just sprinkle in a little flour at a time and mix again until you get a good consistency. You should have enough mixture to divide and shape into about 4 patties. You’ll just scoop out enough in your hand to shape it as you would a hamburger patty. You can make them larger or smaller as you like. Just shape them into rounds and set them aside for a few minutes. Go ahead and sprinkle the tops with a little paprika at this point. Preheat your skillet to about medium and then add some shortening or oil to fry the patties. You should be able to get all four patties in the frying pan at one time. Cook them over medium heat. Brown the bottoms and then carefully flip them over and brown the other side. Don’t overcook them, just let them brown well on both sides and you should be good to go. The more they cook, the drier they’ll be when you serve them. You’ll also want to serve them pretty soon after you remove them from the pan as they will cool down pretty quick. Just take them out when done, place on a couple of folded paper towels to drain for a minute, then serve. See how easy that was, just like making home made burgers in the kitchen. You can serve these as the main course along with some mashed potatoes and another side of your choice. Or, place them between a couple slices of bread or on a bun for a great sandwich. You can add a little more mayo or maybe even create your own sauce. There are lots of choices available as too which sauce to use. I like my “Secret Sauce” that we used with the Fried Green Tomatoes Recipe as well. This is just a basic recipe for Salmon Patties. Experiment with some other herbs and spices after you’ve tried these and let us know in the Comment Section below what you come up with. A local restaurant in my area serves them for lunch every Monday. I’ll pick them up along with some mashed potatoes, pinto beans and cornbread for lunch sometimes. I hope you’ll give these a try and that you really enjoy them. Here’s the printable recipe for it all. Southern Fried Salmon Patties: This is fish even the kids will enjoy eating. Simple, quick, easy to make, and tastes even better between two slices of bread or in a bun. Add a little mayo or whip up your own special sauce and you’ve got supper on the table in no time flat. 1/4 – cup of Flour, added slowly, as needed to adjust consistency. 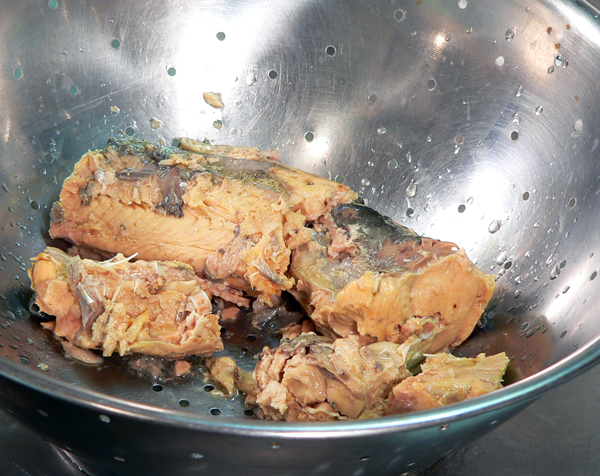 Open the canned Salmon and place in a colander in the sink to drain. Remove any large bones if not wanted. They are edible however. Flake the salmon with a fork. Crumble the slice of bread and toss it in the bowl. 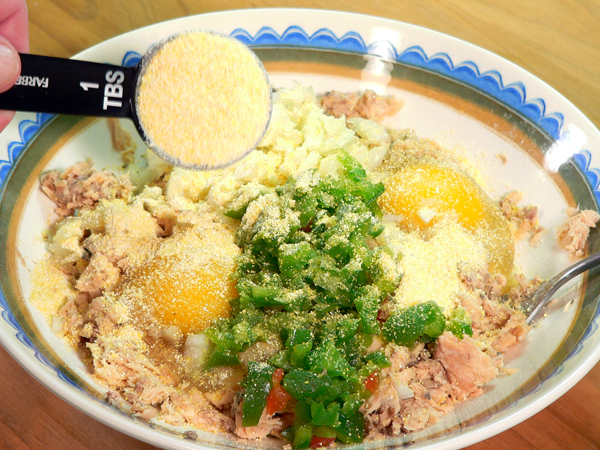 Gently mix the ingredients together, don’t over work. If the mixture is very moist, add flour as needed to adjust consistency. Divide and shape the mixture into four patties. Set aside. 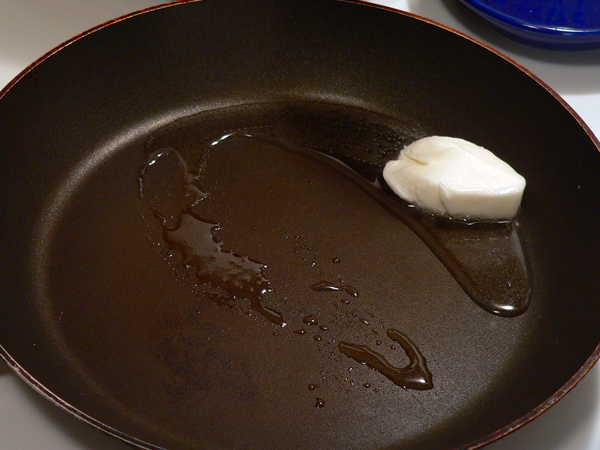 Heat a skillet to medium heat and add shortening or oil for frying. Place the patties in the skillet, brown the bottom. Carefully turn the patties over and brown the other side. When brown on both sides, remove from skillet and drain on paper towel. Serve while warm and Enjoy! You can make up the patties and refrigerate for up to about 6 hours ahead time if needed. For more crunch on the outside, you might consider rolling the patties in bread crumbs before frying. They should be moist enough to hold the crumbs as they are. Your Comments: As always, I look forward to reading your comments if you try one of my recipes. Tell me how you did or didn’t like it, or tell me about any changes you made when you prepared them. I added the note about making them crunchier by rolling them in bread crumbs after I finished the recipe. I haven’t tried it yet, but thought it sounded like a good idea. Let me know if you try it OK. Came a cross your recipes for the first time. I made the salmon patties and they were so good. I did brown my onions just a little. I will be making these again and will be looking at more of your recipes. Thanks and God Bless. My friend wants to know why throw Juice away when later you can use it in your patties. I know why, it would be to juicy and make the patties break up to me. I know it is very tasty, How do you make the secret sauce for fried green tomato’s. I have made this recipe for my husband. He loves salmon patties and makes them himself. He told me this is the best salmon patty recipe he’s ever eaten including his mother’s recipe. Mr Gordon, I like all the ingredients in your salmon patties recipe and will be trying it soon. My only question: are these patties freeze-able? For a short while (one month or so…) As a single person, I can only eat one pattie per dinner, but I like to cook great recipes and freeze for later meals. Thank you! I have made your recipe several times and almost always freeze some of the patties. When ready to fry them up, I just throw the frozen patty into the hot skillet and they come out wonderful. Thank you for sharing your recipe. I made it for the second time today. I did use more herbs and seasoning. I also used crushed salt free saltine crackers and more Jiffy corn muffin mix than what the recipe called for. Today, I mixed in Miracle Whip and wheat germ and made double the amount of the recipe due to how much we love these patties. Oh, minced garlic, Creole seasoning, and Mrs. Dash table blend were added. Both times, my husband and 7 month old son loved it. Outstanding! I made these a short time ago and only changed a couple of ingredients and amounts to accommodate my diet. For example, I substituted celery and 1/2 tsp. onion powder for the chopped onion (which I can’t eat). Also, I used panko bread crumbs instead of the slice of bread. The corn meal is a great flavor component and a must, IMO. Thank you sir. 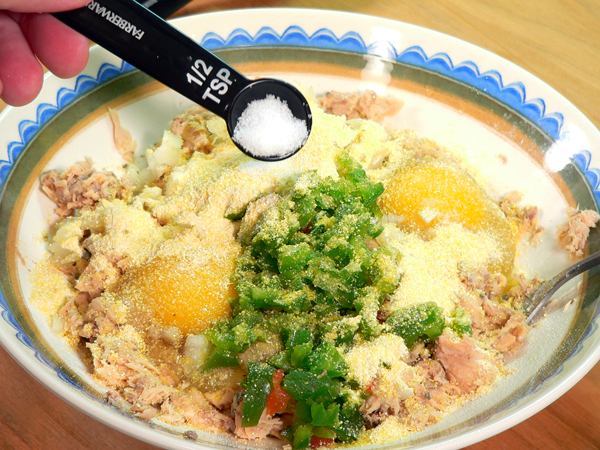 Hi, I make mine in such simple steps I never realized how many people zip them up with so many ingredients! My parents are from Georgia and I thought it was “just the way” southern fried salmon patties were made! Lol I sure miss hers, but glad I learned before she passed. 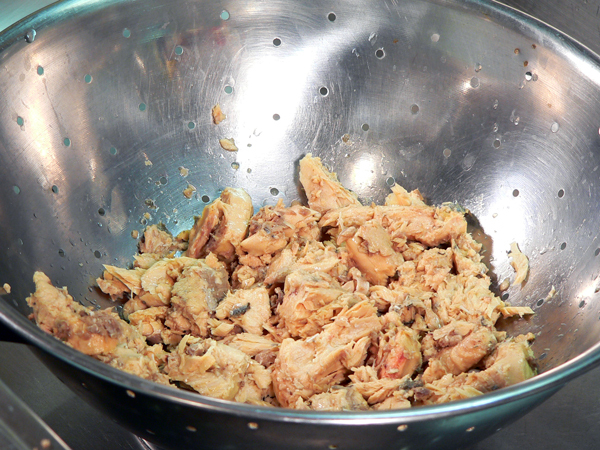 I just break down what’s from a can (skin and boneless), mix in egg and flour. Since I don’t worry about making them into perfect patties, I just use a fork to put them from my bowl (a helping of my mix) and swipe it into the oiled pan. Then push them down in the center. As the sides get crunchy I peek to make sure a crunch is with every bite, then turn them over. 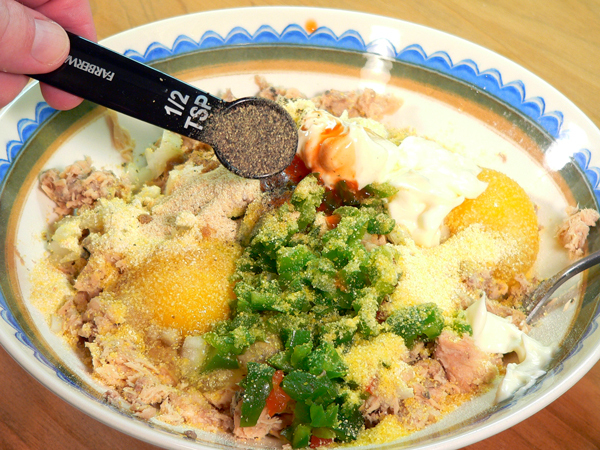 I let each person eating them salt and pepper to their taste. When they look good and crispy, just put them on a plate so any grease drains. I tend to like my plain ol patties with green beans and potatoes! The great thing about not making perfectly round patties is if you make them look like sticks, then kids think they’re just plain fish sticks like out of the box. A great way to get them to eat real fish instead of mostly bread like out of a box. They don’t know the difference as long as they’re long and skinny! For me and the boyfriend I guess we are plain folks lol, but thanks for all the extra ideas.I’m going to try them! Especially with these extras. Being diabetic I have to skip the bread! Thanks for the extra ideas! I grew up in Atlanta and had my fair share of salmon patties. Mama would have made Jesus proud with the way she could feed a family with one can of Double Q! I love me some salmon patties,yum yum!! 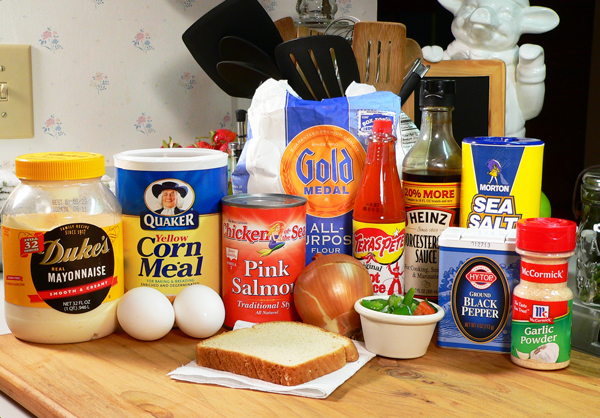 I just found this recipe because my daughter wanted me to make salmon burgers out of the can. I chose your recipe and I must say these are even better then any I have ever tasted. I never knew can salmon burgers taste so good. I am going to try other ingredients just to see what I come up with but this is the best. I’ll have it with some cheese grits in the morning. I substituted that corn meal and flour with about 8 saltine crackers, and used onion powder instead of an onion, I added a bit more salt, and pepper also, but didn’t use a green pepper, the patties turned out fine, and very tasty. I will be trying this recipe, but was surprised at how you made them. My family mixed everything except salmon first and then add the drained salmon (or mackerel) and chill until ready to cook. We never put in peppers or spices or hot sauce (that I am aware of), but my mom liked to add onions (not me). In lieu of cornmeal and bread pieces, however, we used crushed saltine crackers. I do not know why the difference for the binder…perhaps crackers were on hand when bread wasn’t. We also did not make such large patties. Mine are smaller and thinner, taking a very short time to cook. I’m sure my husband will enjoys yours, though, since he likes tasting more spices. Thanks for the education on these. These turned out amazingly good. I used tabasco instead of Texas Pete’s and substituted an orange bell pepper instead of green(that’s what I had in the fridge). I served them on a Kaiser Bun with some dill sauce, coleslaw and more slices of bell pepper for some crunch. 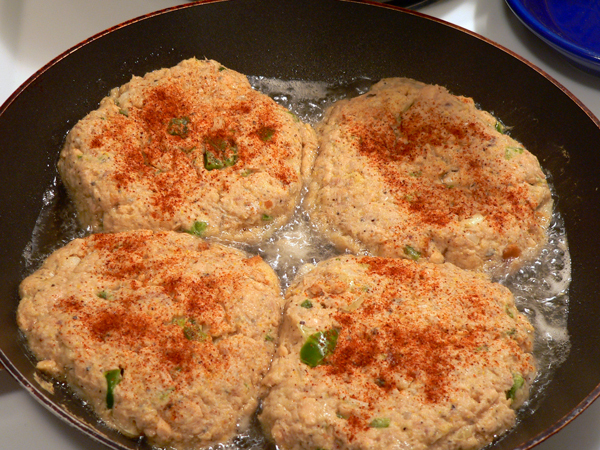 These salmon cakes made a gorgeous/delicious salmon burger! Made this tonight it was different from my usual receipe but still delicious. No sense in looking for any other recipe… these patties are a 10!!! And, that’s what my husband says about them, and I totally agree! Thanks so much for a simple, yet great-tasting recipe! And, that’s my husband’s comment, and I totally agree. Hi Steve. My mom use to make these all the time when I was a kid. Thought I’d finally venture out myself and try them. I made One small adjustment by adding a small bag of crabmeat to the salmon and sprinkled them with Panko bread crumbs on the outside. Fabulous ! Thanks for the recipe. It’s soon to become a regular staple at my house. Just tried the Salmon patty recipe, and it turned out great…. Looking forward to trying many other recipes soon. My husband is out of town and I wanted salmon patties. I asked him for his recipe and he sent me this. All I can say is awesome. I also tried this recipe with crab awesome again. Thank you thank you. Don’t tell my husband but I think mine were better than his. Many blessings to you. Just one word for these….. YUMBUSTERS!!! They were easy, fast and the family loved them. Thank you for your recipe! After years of wanting to try a salmon patty, I found your recipe- and what a hit in my house! A home run in fact. My 7 year old says they are his favorite, he likes them more than my tacos. The only change I made to the recipe was I used my homemade bread crumbs instead of the cornmeal and I added a bit of fresh chopped dill. The dill is a nice compliment to your already fabulous recipe. Thanks again and can’t wait to try more of your recipes. I tried these this evening and I must say these was the best recipe that I could find after searching the web. I liked the addition of all of the ingredients which I already had at home to make these very tasty. The only change I did was that I added red peppers with the green peppers and sauted them with the onions before adding them to the mix because I don’t like the strong taste of the raw peppers. Oh yes, I did sprinkle the patties with corneal also to make them a little firmer. I had the problem of my patties falling apart in the past but this seemed to resolve that issue. Thank you so much for sharing this recipe. My mom and daughter loved them so they will definitely be added to my go to recipes! Thank you! I like to coat mine with Zatarin’s Southern Crispy Fry. They are delicious even when reheated. Tried this recipe on my Big Green Egg (about 400 deg – 4 minutes per side – direct cook – cast iron grate). They were very good. Used homemade tartar sauce as dressing. Not sure I want to deviate from the recipe, but I do like the idea of substituting Tony Chachere for the salt, pepper, and hot sauce. Hi EL, Thank you for pointing out the problem with printing the recipe. I use a plug-in with the site that needed to be updated. Just did that a day or two ago. It’s working for me on this end, I trust it will work for you. My mother made these all the time and I remember her and the salmon patties with lots of love. My husband has to eat gluten free so I was wondering if you had any thoughts on a substitute for the flour? Thank you for makeing me the BOMB chef lastnight…wife and her girlfriend loved them and i ate 6 myself!……i added some Tony Checheros creole seasoning……freeking amazing! I just tried your recipe and I loved it! The best salmon patties I’ve ever had. Will definitely use this recipe from now on. Thanks for sharing! Hi Teddi, Happy 45th Anniversary to you and your husband. Sounds like you’re on a whirlwind trip for sure. I do hope you enjoy your trip, make lots of memories, and that you have safe travels. It DOES sound like a ton of fun. I have never made salmon patties in my life. My girlfriend kept telling me she want me to make salmon patties. In your recipe is the one I decided to use. I followed the instructions word for word. When I finished and let my girlfriend eat a pattie. She said it taste just like her dad’s. She said it taste like I been making salmon patties for years. So thank you sir for sharing. Hi Joseph, It’s my pleasure to share the recipes. I’m very happy to hear that you tried the Salmon Patties, and I’m delighted that they turned out well for you. Keep up the great work. I’m happy to know your girlfriend liked them, and I wish you both all the best. I was craving salmon tonight, but didn’t want to eat it out of a can, again, so I looked for an interesting, easy recipe. These are delicious! I hate regular green peppers so I chopped a jalapeño instead, and added cayenne pepper and made a sauce of yellow mustard and Tabasco. Excellent, and now I have lunch, too! Thanks! 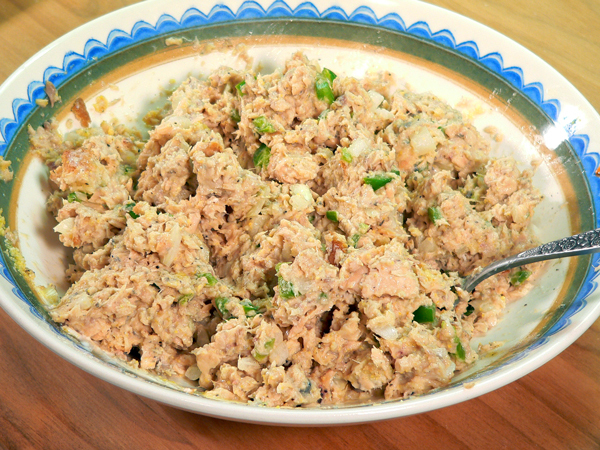 Hi Dough, I appreciate your comments and I’m happy to hear your tried our Salmon Patties Recipe. Sounds like you “spiced” it up pretty good. That might have been a little too warm for my tastes with the Jalapeno pepper and Tabasco, but it sounds good. Just tried this recipe last night – it was so good! Have only made these once before but grew up eating the salmon patties my mom used to make. I like that it is ingredients that I always have. Everyone in my family loved them! Thank you! Hi Jennifer, I seriously looked at a can of Salmon in the grocery store a couple of nights ago, but I didn’t get it. Now, I’m wishing that I had, so I could make some Salmon Patties for myself, you’ve got me wanting them. Ha! 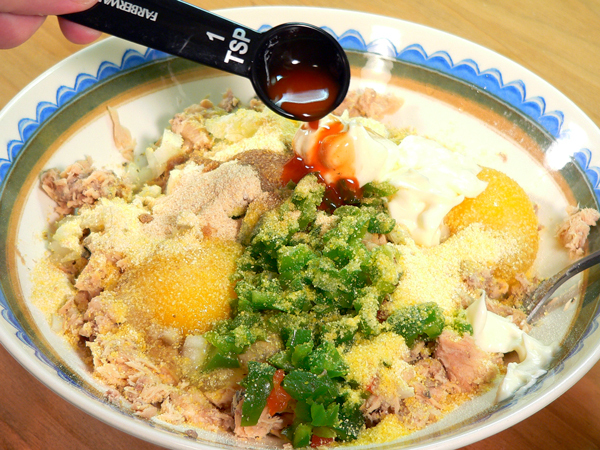 Glad to hear that you tried the recipe and liked it. I’ve never had any leftover long enough to freeze so you’ll have to let me know how that turns out. What doesn’t get devoured around here one day, ends up being consumed the next day, and that’s as far as I ever get. I do hope you’ll be able to get the Cheerwine Soda in your area very soon. It never hurts to ask and once they start carrying it, we’ll let the Cheerwine company know you were responsible for getting it started in your location. How’s that? 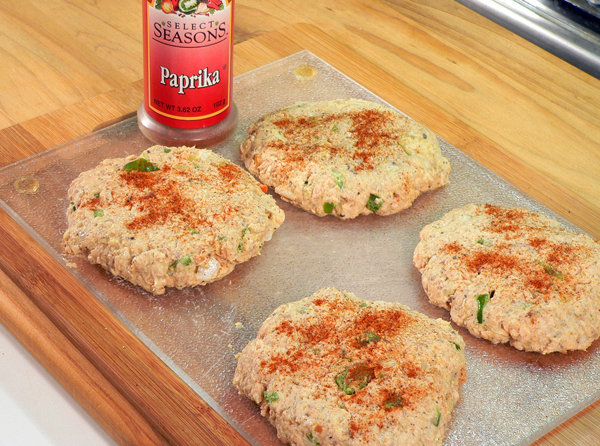 These are the best salmon patties ever!! I hate to say it, but they are better than the ones my mother made when I was a kid. My kids love them, which is saying a lot. So glad I found the recipe. My dad used to make these for me when I was a little fella, I loved them back then. I have made them several times now using this recipe and they are great, I may experiment a bit with different ingredients one day, but for now…if it ain’t broke don’t fix it. My Mama used to cook these (minus the bell pepper) in mini patties and we would have it with scrambled eggs and cathead (drop) biscuits. Pour some syrup on the patties and wow a delish quick breakfast for supper. Seeing these brought back great memories, thanks!